It’s guest post day here at Duct Tape Marketing, and today’s guest post is from our newest team member – Alex Boyer– Enjoy! You have always been told your business needs a presence on social media sites like Facebook and Twitter, but you have yet to see tangible results. Don’t give up! Here are five simple steps to kick-start your social media this year. You should set a basic goal for your social media activities for the year. This can be something simple like “increase participation in specials or sales,” “interact with existing customers and strengthen brand loyalty,” or something more complex like “Create a personality for your brand.” Every social media post for the year should in some way help you achieve that goal. For example, take two popular restaurants in the Kansas City area: Grunauer (@grunauerKC) and Blanc Burgers and Bottles (@BlancBurgers). Blanc uses social media to remind their customers of daily and nightly specials, and release photos of new burger creations. Gurnauer forgoes the daily specials and instead uses their Twitter account to create personality for the restaurant, cheering for local sports teams and commenting on news stories. Both restaurants have significant social media following and every post from both fulfill their respective goals. Now that you have a goal to achieve, it is time to draft a plan for your social media year. You should start by creating an editorial calendar. Use your calendar to list your yearly sales events, local events (such as high-profile concerts or local festivals) and holidays. Keep an eye out for obscure holidays like “Talk like a pirate day” or “National Cheeseburger day,” as these are very popular on social media. You can even pre-draft social media posts for each of these events for use later. If you ever reach a point in the year where you don’t know what to post, use this calendar for ideas. You can even use the editorial calendar to plan “messages of the week,” content themes that you can use for a week or month at a time. For example, you can have your blog posts for a month focus on sales strategy. That way, you have a uniform starting point for each of your posts. Give your customers a reason to interact with your social media by giving them “Social Specials”. These can include giveaways or discounts in store. Ask your fans to “Like this post for 10% off this week” or “Retweet for a chance to win.” In the case of discounts, you can even ask customers who come into your storefront if they have social media, and then tell them they can get a discount if they like your page. This will not only expand your social media following, but also engage users that are already customers. Plus, posting promotions on social media is cheaper than printing coupons in the newspaper. Social media platforms shouldn’t be used simply to distribute your messages, they should be a 2-way street between you and your customers. Use Twitter, Facebook, and your blog as a customer service tool as well. Allow your customers to come to you with their complaints, and address them promptly. Also, thank supporters for their kind words and share their positive reviews. This gives your customers reason to interact with your social media pages, and creates a sense of community around your company. Finally, the most important step to getting the most out of your social media is to create content. You need to continue to create engaging, exciting content to draw new fans and keep your current fans’ attention. You cannot forget about social media and must post regularly. The steps above should help you keep a steady flow of content for your supporters, but it is ultimately up to you and your team to keep executing. Your social media following cannot grow without content. 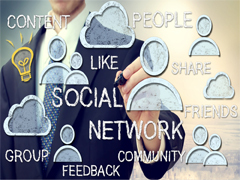 Social media marketing should be an important part of your marketing plan. Follow these five simple steps, and your social media presence is sure to grow over the next year. Alex Boyer is Community Manager and Content Ninja for Duct Tape Marketing. It is his job to create and scour the internet for the best content for small businesses. In addition, he will continue to grow the Duct Tape Marketing community through interaction with clients and consultants in the Duct Tape Consultant Network on our website and through Social Media. Alex has a background in political marketing, where in-depth opposition and messaging research is critical to a successful campaign. He is focused on taking those tactics and using them to help your small business grow and reach more potential customers.